Football or soccer, is the name of similar game. Anyone who dreams of becoming a star football player needs to follow certain guidelines to achieve their objective. Football is not only a physical game, but also a mental game which involves a lot of strength and determination. Every objective that we dream to achieve needs lots of practice and hard work. Following a certain, pattern of practice will not only helps to achieve the goal, but will increase the confidence of a person. Here is the list of certain guidelines which can help any person to achieve their dream of becoming a star football player. 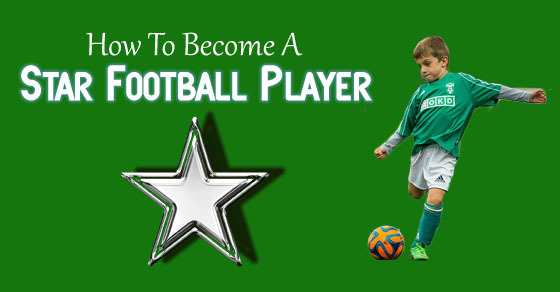 How to Become a Star Football Player? Diet is an important part of dreaming to become a football player, since football is a game which involves lots of physical strength and stamina. So, it is important to add lots of proteins and carbohydrates in the diet plan of the person dreaming to become a football player. Green leafy vegetables, fish, milk, pulses and fruits are a great source of proteins, so they should be involved in the diet. A good diet provides great stamina and continuous supply of energy to the player while playing. As it is always said practice and hard work are the key to success, so to become a star football player a person has to practice a lot. By practicing the player can learn lots of techniques which can be helpful to him while playing a match. Practice should be done in a scheduled manner so that it does not interfere with other work of the player. The practice increases the confidence of the player and also increases his stamina. In case, the player cannot set a particular schedule of practice, then he shall try to practice any time that is available to him. A player shall always drink lots of water and keep himself hydrated all the time he plays football. Drinking a lot of water is very important otherwise it can result in dehydration of the player. Water is an essential stress buster and helps to relieve the player of the pressure while playing. In case the player suffers from dehydration, then it can really affect the performance of the player. So, it is very important to be hydrated and avoid dehydration. A player can also add an energy drink to the water to increase the taste and also increase the energy level in the body because water release quick energy in the body, as compared to the solid food material. A player shall always remember his position in the team and, also when he is on field playing. Like in the game of football there is one player who is the passer, it is his responsibility to pass the ball to the correct player. Also, there is goalkeeper whose duty is to save the other team from doing the goal. So, the player shall always focus on his duties because his one mistake can completely change the game and sometimes may result in a loss to the team. A player shall always maintain friendly relations with the team members. Friendly relations amongst the team members are very important because it helps the player to build his confidence. In this way, the player can get to know his team members in a better way and also their playing styles. This will help the team members to know each other and will help them to understand each other. A player shall always keep his eyes on the ball and never miss the ball. The ball is the key point in the game and can change the game if the player misses the ball. During the game, the player shall always try to keep the ball with him and never let the member of the opposition take it. A player shall have complete knowledge of the game. He shall know the rules and regulations of the game regarding the goals and penalties. A player can ask the team members and coach regarding the rules. If the player has complete knowledge about the game, it will help him to play and perform better in the game. The player can also avoid creating any mistakes and fouls, thus creating a better score for the team. A player shall always have good sportsmanship towards the game. He shall always respect other team members and always try and help others in any way he can. Like a good sportsman he shall never cheat to win the game. A good sportsman is one who plays the game in the right spirit and never plays it to win alone. A player shall always decide the position he wants to be in. Like, in cricket a player can focus on becoming either a batsman or a bowler. So that he can focus on the way he wants his career to shape up. Same goes with the game of football the player has to decide whether he wants to be a goalkeeper or main striker. Also, the defender is more important because he is the one who prevents the ball from coming in to his area. If the player decides his position and practices accordingly, then he can secure his position in the team. A player shall watch a lot of football either on television or while it is being played on the ground. These days a lot of sports channels are being aired on television, a player can select any of these and learn more about their game. A player shall not only watch the games which are being played by his team, but also the one which are being played by others. This way he can learn more about the mistakes that a player can make and avoid doing them. Same goes with the tactics which can be beneficial for the team. A player can incorporate them in his game and can use them when needed. A player shall plan his daily routine. Training on a regular basis is very important because only then the player will be able to play well in the tournament. Training on a daily basis means eating correctly and doing the exercise regularly. But, a player shall not work too hard because then it might result in cramps in the body and might prove dangerous for the player. If the training sessions are too harsh then the player shall take breaks in between and relax. To become a good football player you should have determination and motivation. To play only to earn money, success and fame are not the factors that will help you to enjoy the game, but a player’s love and passion for the game are the key factors to motivate the player. A player who enjoys and loves the game will experience the feeling of satisfaction only by playing with great determination and not by the money he earns. As said earlier, training hard is the key to the success in any game, but at the same time training smartly can prove more helpful for the player. Every player has his own strengths and weakness, and a smart player should always pay more attention to polish his strengths and correct his weak points. While training in a team, sometimes a coach may not be able to identify the strengths of a player. In such a situation, it is the duty of the player to work on his strengths and make it visible to the coach. This can prove helpful to the player as he can be selected as captain of the team or may be selected for some tournament which might help him to build his career strong. To achieve any goal, a person has to believe in himself. Whether it is playing football or learning any form of instrument, a person has to believe in himself. Always have a positive attitude in life, only then a player can take the challenges which he has to face. There may be people who will demotivate you and discourage you, but a real player is one who never loses hope and is always focused towards his game. Also, if other players might not accept as a strong player, then faith in yourself is the key that a player will prove himself to others. In today’s fast moving world of internet, a player can post his video on various social networking sites. As various sponsors choose their players online so it might prove lucky for the player and he might get selected. Also, there are many sponsors that offer scholarships to the players and encourage the young talent to play well. But, before posting the video on the internet it is the duty of a player to get it checked by some professional player. Football is a game which needs a lot of physical strength and great stamina. A player has to spend a lot of time on the ground for practicing. To do all these things a player has to be in great shape. For this the player has to keep a regular check on his diet plan, his weight and also has to exercise regularly. Also, the player has to ensure that he does not feel sick. There are so many players who are competing for the same position in every team and every tournament. So, it is very necessary for every player to keep a check on the competition he has to face. For this, it is very important for every player to play well and be physically and mentally fit. Always follow the timetable that is set for you to bring that stamina and capacity to play. Along with all these things it is really important to follow the game ethics and always follow the right way in the game. Football is a game all about the kicks. If a player cannot handle kicks, then this game is not for him. While a player is playing football, he has to handle kicks, which can be severe and sometimes, dangerous. There can can be severe injuries and a player can also fall while running, resulting in some irreparable damages. A player shall always attack his opposition with full mental and physical strength. A player shall create such an image, that his mere presence makes the opposition goes weak on the knees. All this can be achieved by hard work, practice and the passion to win. Even if the player is not playing on the field, a player shall always be attentive of what the coach is telling all the players who are off the field. Some of these advices can really be helpful to the player while he is playing on the field. By following all these above mentioned tips, a player can really become a star football player. Every football player dreams of becoming Ronaldo, David Beckham or any other famous football players. Along with hard work, watch lots of tournaments and try to learn the tactics these player uses while playing. So, just go out there with that positive attitude and have complete belief in yourself. Don’t let any hurdle stop you from making that special place you always wanted for yourself.